It's coming up to that time of year again. The time of year when Singapore celebrates its independence from Malaysia in 1965. It is celebrated every year on 9 August. The is also the time of year for us to enjoy the fireworks and be amazed when we spot the fighters jets from the Republic of Singapore Air Force rehearsing for the National Day Parade flypast. "But it's only June!" you exclaim. When Singapore celebrates, they want to make sure nothing goes wrong on the day. If you're keen to catch a glimpse of the fighter jets in action, the CAAS have released an Air Supplement schedule for airspace closure for the event. The National Day Parade will be held at the Float @ Marina Bay again this year. The first rehearsal is Saturday 22 June 2013, and for those who want to see what all the fuss is about, or are wanting to photograph the fireworks, this would be a good time as there aren't any crowds. 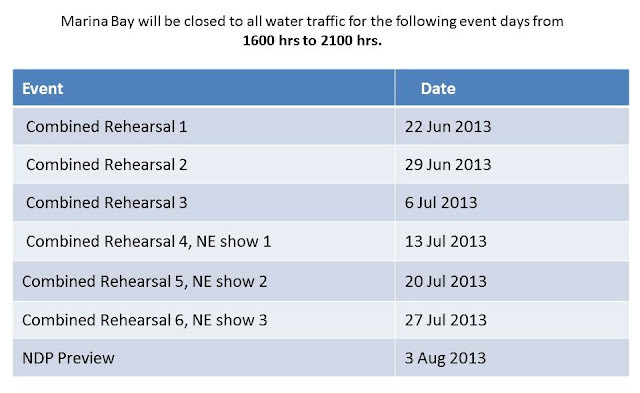 Fireworks will be launched at the Preview Parade (3 August 2013) and the National Day Parade (9 Aug 2013).